NintenGen: New South Park Episode is about the Wii! New South Park Episode is about the Wii! The show has not even aired yet here in San Diego, CA but I've found a pic that was put up on the Neogaf game forum. 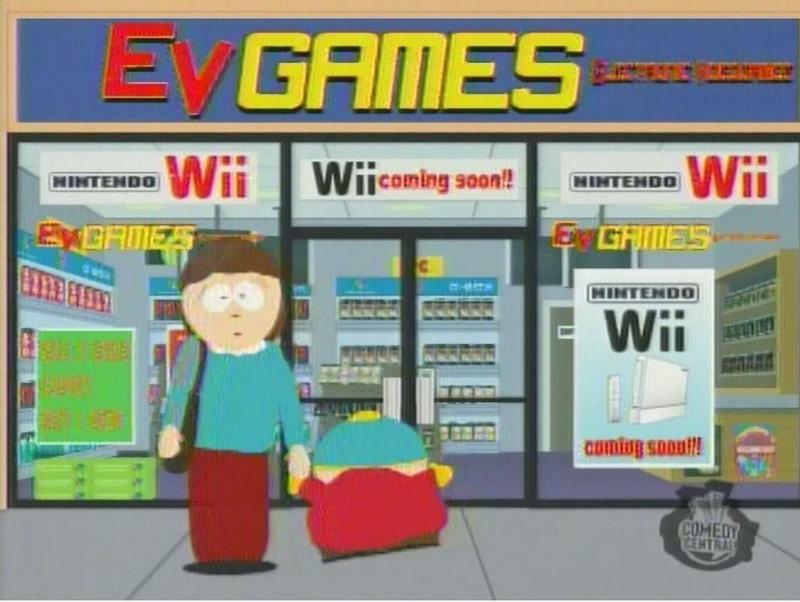 Looks like Cartman really wants the Wii. I think we can officially call the Wii mainstream now and its not even out yet. I just finished watching the episode, and I must say that it was very good. Cartman wants a Wii so bad that he is willing to freeze himself for 3 weeks until it comes out. The other story in the episode is evolution vs. creation being taught in school and just the beliefs in general(the never ending feud). Cartman freezes himself in the snow and it turns out that he wasn't frozen for 3 weeks but more like 500 years when he wakes up in the future. Everyone in the future has turned atheist and a war between other atheists is happening. All Cartman wants is a "Nintendo Wii" to play during all of this and thats all that matters to him. So Cartman is trapped in the future and the Wii is nothing but an ancient game playing device long forgotten. We'll find out what happens in the next episode since this one was to be continued. Great show!! Anonymous, did you see the episode yet? I still have to wait 2 hours or so until it comes on here. Looks good though! I remember in an interview, Matt Stone and Trey Parker mentioned they were excited about the Wii. I seem to remember something about that interview a while back. Looks like they did Nintendo a big favor, even if Nintendo didn't ask them to. Check out GoNintendo for 7 new Zelda videos!!! Awesome!! !